View from a VCR LTER research boat cruising along estuaries where seagrass restoration projects are underway. The waters lapping against the shoreline marshes reflected bright blue sky above. 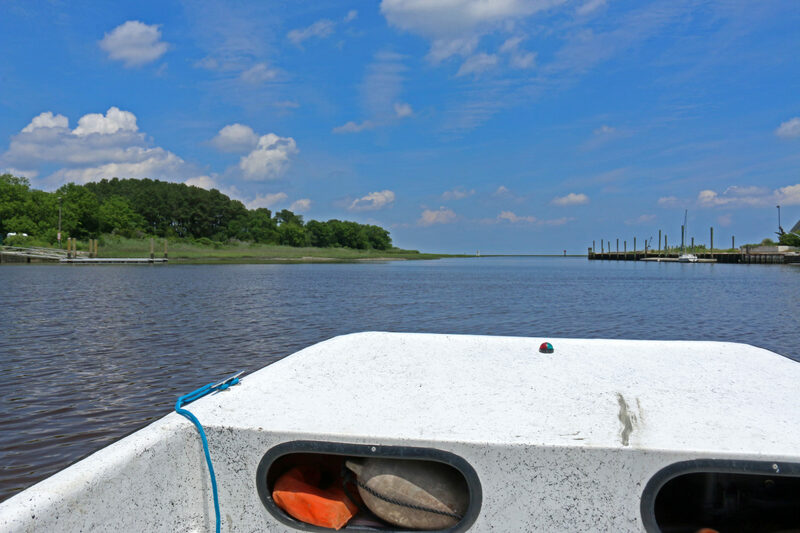 I sat in the front of the Virginia Coast Reserve Long Term Ecological Research (VCR LTER) site’s boat, exploring the estuary with VCR LTER’s dedicated staff. The tall Spartina alternifora grasses waved in the breeze a foot or two above the waterline, and dozens of egrets, herons, and ibises prowled for prey among the shallows or flew overhead. Though the above-ground landscape was teaming with life, the aquatic world was home to an equally amazing story. In previous decades, seagrasses carpeted the bottom of the estuary. Juvenile fish species and sea turtles sheltered within the aquatic vegetation, also home to shellfish and crustaceans. At one time, the scallop population was so large it supported an entire seafood industry along Virginia’s Eastern Shore. Unfortunately, in the 1930’s disease combined with a powerful hurricane killed much of the seagrass meadows. While the seagrasses eventually regenerated in the Chesapeake Bay, they did not return to Virginia’s other coastal bays, and bay scallops, blue crabs, seahorses, bass, waterfowl, and other species either fled or were wiped out altogether. In the mid-1990’s, a local waterman found a remnant patch of eelgrass in a bay off the Eastern Shore, setting the stage for one of the most important seagrasses recoveries in the world. Though the improved conditions made restoration possible, there was only one thing missing: seeds. Using 70 million new seeds, a team led by the Virginia Institute of Marine Science, including a partnership between the VCR LTER and the Nature Conservancy, replanted seagrass throughout Eastern Shore. Today, the restored seagrass stretches over 6,000 acres. Researchers and scientists monitored the sites before and after planting seagrass, and now have an unprecedented database documenting how the system has evolved. Dr. Karen McGlathery, one of the lead scientists on the project, explained to me how the large-scale and long-term nature of the restoration has shed critical light on how these ecosystems change over time. For example, it took nearly a decade for carbon to be stored in the marine environment, also known as “blue carbon.” Abundance and biodiversity of fish species in the seagrass meadows has increased, and they are preparing to reseed the meadows with bay scallops. Perhaps most interestingly, the researchers have collected location data on the regrown seagrasses. Because seeding was used, there is high diversity among seagrass patches. As climate change alters the growing conditions within the bays, higher temperatures could kill back certain seagrass meadows but not others. 2015 was particularly warm, and Dr. McGlathery and her colleagues observed a significant dieback and then partial recovery. Through their database, they will take samples of which seagrasses survive, perhaps discovering in which locations eelgrass can live through increased temperatures. The project is now in its 16th year, and demonstrates the importance of long-term monitoring. As scientists and researchers continue to draw lessons from the restoration, they provide inspiration for future seagrass restoration projects throughout the country.